Melt the butter in a saucepan over medium heat. Add the onions, celery, bell pepper, green onion, the Magic Seasoning Blend®, garlic, Magic Pepper Sauce, Worcestershire sauce and bay leaves. Cook, stirring occasionally and scraping the bottom of the pan until the mixture starts sticking excessively, about 6 minutes. Stir in the milk and catsup. Continue cooking for about 2 minutes, stirring occasionally. Remove from heat and allow to cool at room temperature. Preheat the oven to 350°F. Place the beef and pork in a large mixing bowl. Add the eggs, cooked vegetable mixture (remove bay leaves) and bread crumbs. Mix by hand, being careful not to overmix. Overmixing will release the protein in the meat and make it mushy. Blend no longer than necessary to distribute ingredients. Place mixture in an ungreased 13" x 9" baking pan. Shape into a loaf that is about 12 x 6 x 1-1/2 inches - - it will not touch the sides of the pan - - and bake uncovered for 25 minutes. Raise heat to 400°F and continue cooking until done; approximately 35 minutes. 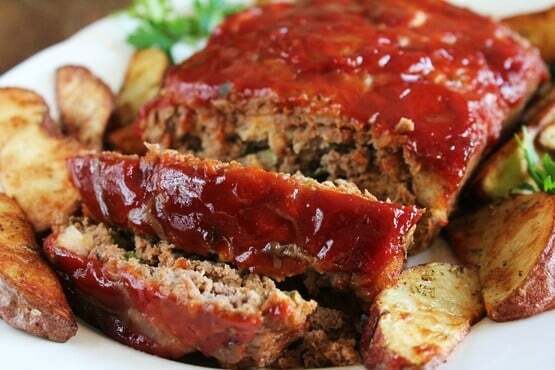 Tip: We buy Lunardi's oven ready made meatloaf. Just omit salt and some onion.